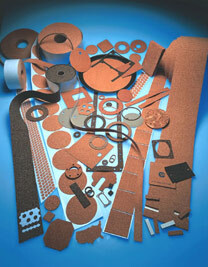 Atlantic Gasket Corporation manufactures a wide range of products from composition cork and cork rubber materials. We specialize in producing cork rolls and cork sheets that can be used to make bulletin boards, coasters, gaskets, spacer pads, and much more. Both types of materials can be supplied in full width rolls or fabricated to meet your exact requirements, with or without a pressure sensitive adhesive backing, and as individual pieces or on “kiss-cut” rolls. See our PSA Chart for details. Composition cork and cork rubber have different qualities that make them suitable in different applications. For instance, composition cork is lightweight and stable and exhibits compressibility and moisture resistance. Its aesthetic appearance makes composition cork popular for consumer product applications. Conversely, cork rubber, a blend of natural cork and a variety of elastomer materials, is excellent for gaskets and other industrial applications. Contact Atlantic Gasket or read on for more information. The perfect material either as a decorative or protective backing for novelty items, composition cork is commonly used on the back of coasters, trivets, place mats, and many other consumer products. The advantages of composition cork are two-fold: one, to protect surfaces from being scratched and two, to add a high quality look to the finished product. Our composition cork can be supplied in continuous rolls 36", 48", and 54" wide, or slit to any width from 1/2" to 54" to accommodate your application requirements. We specialize in die cutting cork to size so that all you have to do is apply the cut part to your end item. We have many standard dies in sizes ranging from 1/4" dia. to 6" dia. and would welcome the opportunity to save you both time and money by allowing us to provide you the precise finished cut part you need. 1/32", 3/64", 1/16", 3/32", 1/8", 3/16", and 1/4"
An excellent gasket material, cork rubber can be supplied as a blend of Cork and Neoprene, Cork and Buna-N, Cork and Hypalon, and Cork and Silicone. The selection of the best blend of cork and rubber and the correct density will ensure that the finished gasket or part will last for years in your application. Please contact one of our design engineers today and allow us to use our extensive experience to assist with determining the optimum material for your application at the most cost-effective price. Please click here for specifications on our composition cork / cork rubber materials. Our standard rolled cork rubber is available in rolls 36” and 42” wide, and upon request, we will gladly slit this material to meet your exact requirements. Our cork rubber is stocked in .031”, .062”, .125”, .187”, and .250” thk. rolls with many other thicknesses available upon request. We can also supply cork rubber to meet many military specifications including Mil-T-6841 and Mil-C-6183 (Type 1 and 2). Please click here for pricing for Mil-T-6841 / AMS-T-6841 cork and rubber tape.